Mega-Lift XPK30-2 3 ton paper roll pallet truck is a compact truck with the loading capacity of 3000 kg. This truck can hold paper roll with diameter ranging from 800 mm to 2000 mm. This electric pallet truck is extensively used for easy movement of paper rolls from one place to another. It can provide secure and easy horizontal paper roll movement. 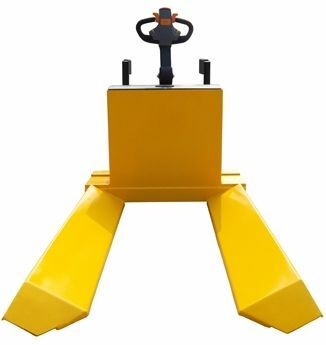 Its ergonomic tiller arm has an optimum length, which provides easy control and excellent visibility. The arm also ensures the operator a secure distance from the paper roll pallet truck. This electric pallet truck is not only used for medium and high intensity work in paper industry, but also used in warehouse, factory, supermarket, etc. 1. Mega-Lift 3 ton paper roll pallet truck adopts SWISS BUCHER brand hydraulic pump. 2. This truck possesses regenerative braking function. 3. This electric paper roll pallet truck is equipped with CURTIS electronic controller, Germany Frei handle and Emergency power disconnect switch. 4. Braking applied with handle upright and horizontal position increases the safety of the paper roll pallet truck. 5. Emergency reversing device in the handle improves operating safety. 6. Five points structure brings the electric paper roll pallet truck more stability. 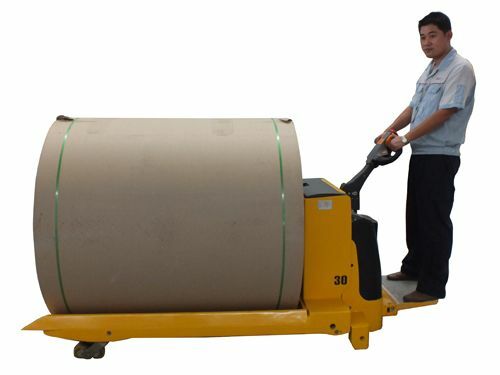 As a professional import of 3 ton paper roll pallet truck, S2S Create & Engineering Co., Ltd also supplies many other high-quality products for customers, such as electric stacker, electric reach truck, electric tow tractor, scissor lift, aerial order picker, manual warehouse equipment, customized truck, etc. Most of our electric pallet trucks have passed the CE certification and ISO9001:2008 and they have been well received by clients from 40 different countries and regions. OEM and ODM cooperation relationships are welcome. If you need 3 ton paper roll pallet truck, please contact us freely.